This post present the protocol specification between Raspberry Pi and Arduino of the ArduiPi board. 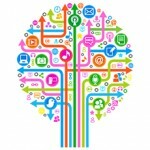 The protocol will be the same and independant of the communication channel used. If you are on this page, this means that you probably already know the goal of the ArduiPi project. If not please refer on the post that present this project on this blog. Using Serial Port, this is not my favorite one because I like to use the serial for doing something else. Using SPI, better but once again not my favorite because you need 4 wires and need a “chip select”, so another Rasbperry I/O. Also it is synchronous, so you can’t send back results immediatly, but it is cool and fast. Using I2C, really simple to implement, lot of devices can take place on i2c and just need 2 wires. The communication is done by sending one or more byte to Arduino, then Arduino can immediatly do the action such of controlling a port and if needed return data such as analog value for example. On ArduiPi the arduino i2c slave address is defined to 0x2a and it is connected to i2c bus 0 of the Raspberry Pi or i2c bus 1 for the Raspberry Pi Revision 2. So we can issue the linux i2c command i2cset and i2cget to set or get information. If i2cget or i2cset command use a word instead of a byte for the last parameter, the command should end by w to indicate the value is a word value. pi@pi02:raspberry# ./arduipi --help arduipi Usage is: arduipi [options] [protocol] [mode] [-d device] [-a address] [-t data] --<D>evice : device name, i2c or spi (default /dev/i2c-1) --<a>ddress : i2c device address (default 0x2A) --<d>data : data to send protocol is: --<I>2c : set protocol to i2c (default) --<S>pi : set protocol to spi mode is: --<s>et value: set value (byte or word type determined by data size) --<g>etbyte : get byte value --<G>getword : get word value --<q>uick : i2c quick check device --ac<k> : i2c check if device sent ack Options are: --ma<x>speed : max spi speed (in KHz) --dela<y> : spi delay (usec) --<b>its : spi bits per word --<l>oop : spi loopback --cp<H>a : spi clock phase --cp<O>l : spi clock polarity --<L>sb : spi least significant bit first --<C>s-high : spi chip select active high --<3>wire : spi SI/SO signals shared --<N>o-cs : spi no chip select --<R>eady : spi Ready --<v>erbose : speak more to user --<h>elp <?> indicates the equivalent short option. Short options are prefixed by "-" instead of by "--". <?> indicates the equivalent short option. Short options are prefixed by "-" instead of by "--". You can communicate with i2c communication with classic i2c program and/or arduipi program. The sample that are in the following table can be run on Raspberry Pi Revision 2. If you are using Revision 1 change all i2cget and i2cset command -y 1 to -y 0 (Revision 1 use i2c bus 0, not 1). arduipi program autodetect revision and adjust correct i2c bus if not specified. The command will always refers to the port where we want to make action. You have the possibily to talk to the Arduino using either the AVR name or Arduino name depending on what is your preference. Set the value to be returned by the above ping command. 0x01d Get Port - Get the given Port value. 0x01d [00-FF] Set Port - Set the given Port to the following given hex value. 0x00 to 0x12 Get Digital Pin - Get the given digital pin value. 0x00 to 0x12 [0-1] Set Digital Pin - Set or clear the given digital pin given by item byte. 0x00 to 0x12 0xD[0-2] Set Digital Pin Mode - Set the given digital pin mode. 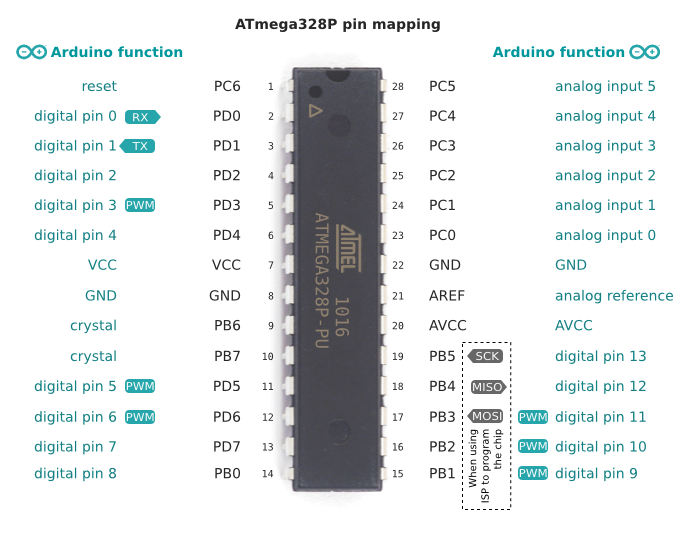 Get analog value for the analog arduino pin given by command byte (A0 to A5). Set PWM value for the arduino pin given by command byte.